Juggling is a skill that Peter Cicalo of Hard Life Products in New Jersey has come to perfect. He balances his growing concrete business with a busy career as creative director for an advertising company. After long hours at work he comes home and spends the rest of the night in his garage shop creating the concrete works of art that he loves. Peter is no stranger to the hard work that comes with construction. His father was a contractor, and Peter grew up on the job site. After jumping in to his career in advertising Peter decided to put his childhood skills to use remodeling a bank owned home in his area that he hoped to buy. He felt concrete countertops would add the perfect flair to this home. The deal eventually fell through, but Peter’s love of concrete was born as he kept exploring the possibilities, creating and selling little things made from concrete on the side. 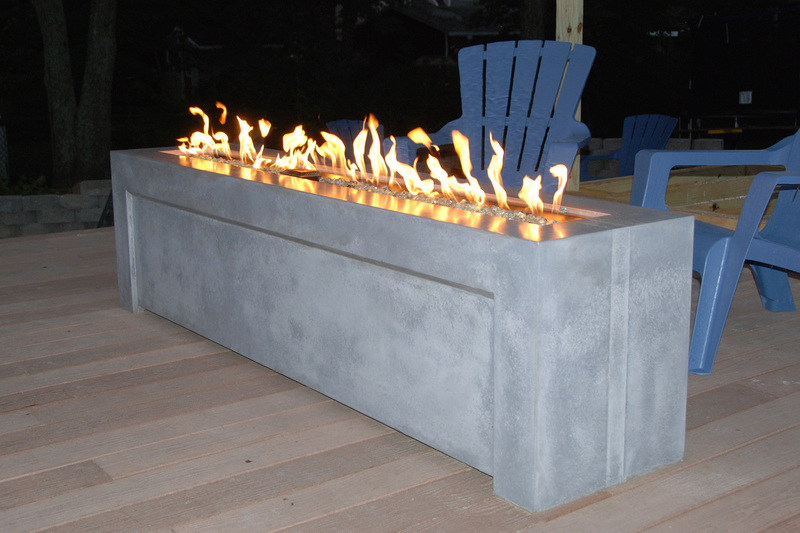 This modern inspired concrete fire pit is the perfect place to warm up on a chilly New Jersey night. Then last year he came to The Concrete Countertop Institute and took our Ultimate Course. The skills he learned ignited his passion, fueling him to take the next step and do more with concrete. Currently he juggles his day job and his concrete business, but he plans to expand enough that he can quit his day job and make concrete his primary focus. 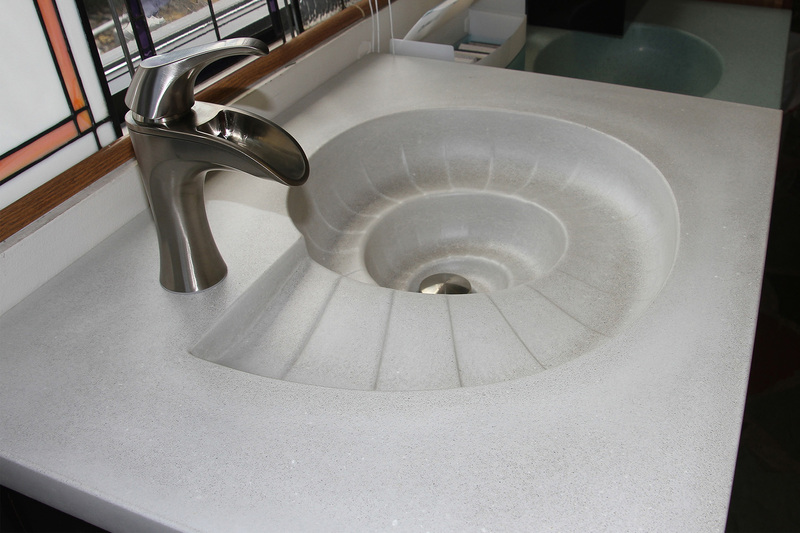 Living by the sea provided the inspiration for this conch shell sink that appears in a local showroom. Although he’s short on time, Peter doesn’t mind spending hours working with concrete after a long day in the office. He says, “The day drags on and then I get in the shop and the time just flies.” He finds himself accidentally staying up way too late without even realizing where the time has gone. Work is just work, but concrete is something to look forward to. 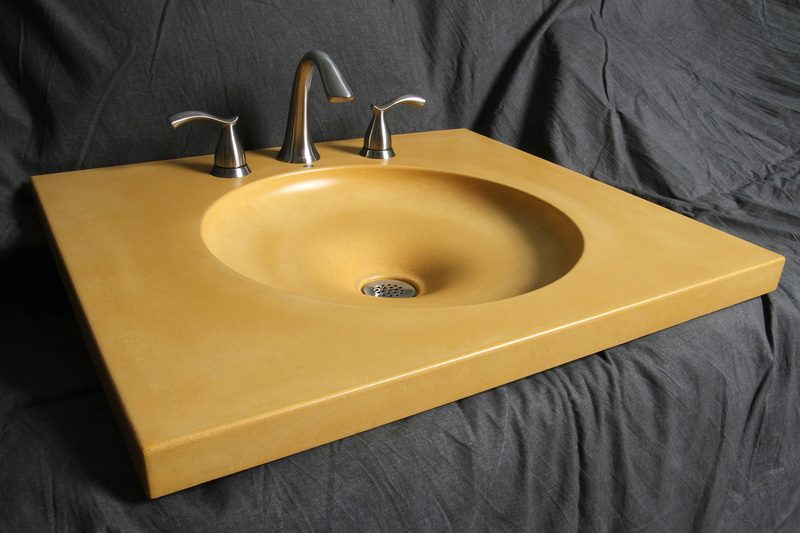 No one would ever guess this stunning sink was concrete if you didn’t tell them. Digging into the industry, learning about the different methods people are using, and discovering the wealth of information out there continues to expand his skill set. He encourages others trying to juggle work and concrete to research and learn as much as possible. One of his favorite aspects of his training with CCI was learning the “whys” behind common concrete practices. He doesn’t just want to know what to do, but rather why he should or shouldn’t use a certain method. Since he doesn’t have a lot of time to spare, knowledge about concrete is essential for creating each of his artistic masterpieces. 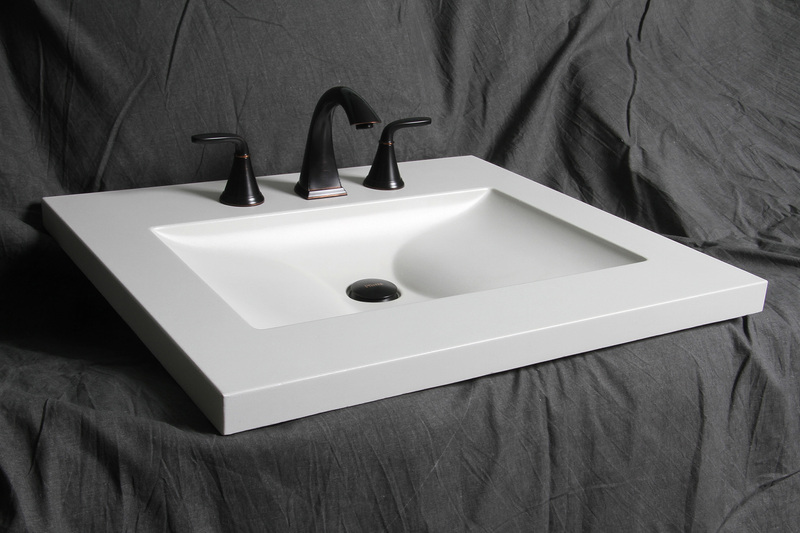 Another beautiful sample sink by Peter Cicalo. Peter is a perfectionist by nature and finds that surprisingly this translates into stunning work in the shop. Yes, concrete is a messy medium, but with the techniques he’s learned through training and research, he can control the concrete and create functional and beautiful art. He loves knowing that the pieces he makes will be admired and used every day. Since his shop is small and he doesn’t have unlimited time to focus on concrete, Peter currently works on smaller scale projects like fire pits, vanity tops, and sinks. Getting started part time and with small projects is a great way to grow your concrete countertop business organically. We certainly see a future filled with concrete possibilities for Peter, as his pieces are truly magnificent.